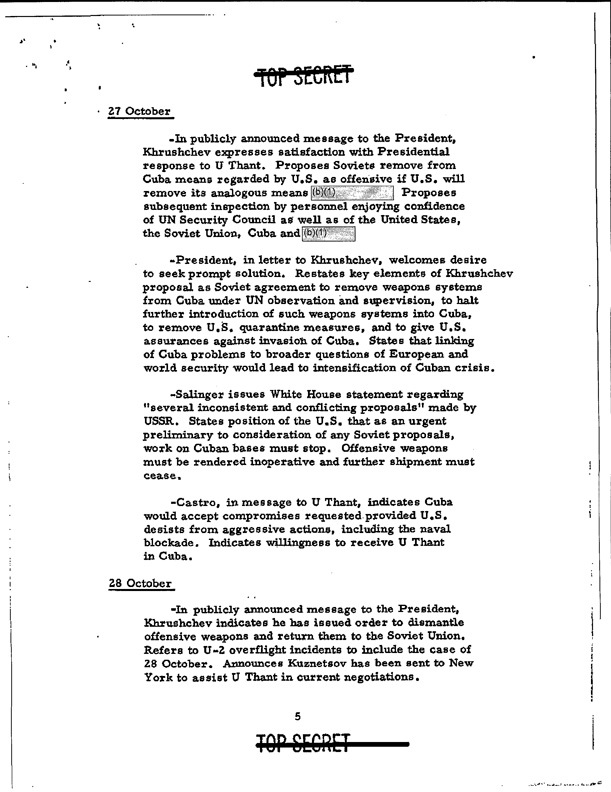 When the Defense Department released document 2 in September 2013 it withheld the references to Turkey from the section concerning Nikita Khrushchev’s public message to President Kennedy on 27 October 1962 suggesting a trade of U.S. missiles in Turkey for the Soviet missiles in Cuba. In its 2009 appeal letter to the Defense Department the Archive pointed out that Khrushchev message’s was in the public record, but the Pentagon maintained the deletions. Let me get the suspense over with. Here’s a classified fact: We, the United States, based medium-range ballistic missiles carrying nuclear warheads in Turkey in 1962, which angered Soviet leader Nikita Khrushchev so much that he put his own into Cuba. Wait: I’ve read all about that. It’s been declassified, hasn’t it? The word is the Cold War is over, yet Cold War secrecy rules still control the government’s information systems. The Defense Department still can’t bring itself to declassify nukes in Turkey, and Italy, and the 50 or so other countries where we idiotically stationed them during the Cold War. 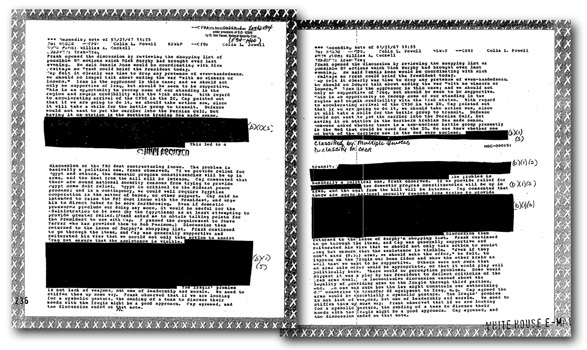 We have two versions of the same page of White House e-mail, addressed to then-deputy national security adviser Colin Powell, with the top and bottom blacked out from one review, and the middle blacked out from another, 10 days later. Turns out it was the same reviewer both times. So goes the highly subjective process of classification. Two versions of the same page of White House e-mail, addressed to then deputy national security adviser Colin Powell. The reviewer classified the deletions each time at the Secret level, meaning he believed their release would cause “serious damage” to U.S. national security. But let’s talk about Clinton. Thank goodness she used a private e-mail server when she was secretary of state. 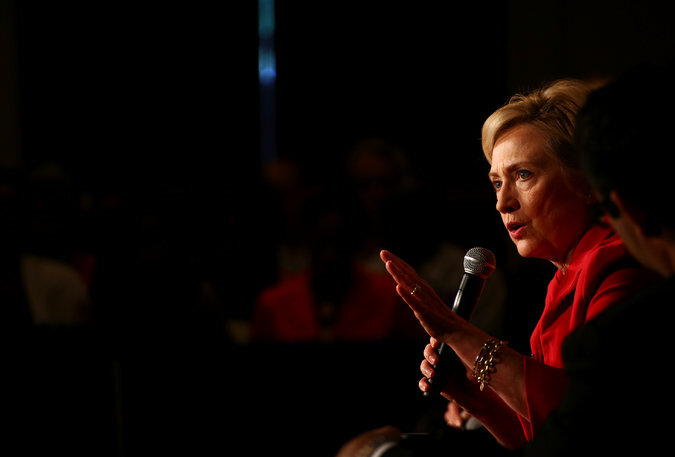 If she had used the State Department system, practically none of her e-mail would survive. That’s how bad State’s electronic archiving was then. Instead, the State Department has 30,000 of her messages, and history is becoming much the wiser. Her critics, not so much. Now, the same folks who clamored to see those messages seem to want to lock them up in classified vaults. Foolishness. They intend to redact the e-mails, thus putting red flags right on messages that circulated for years in unclassified form, thus highlighting the secrets they contain, if there really are any. Keeping the e-mails unclassified would actually be the best way to protect anything sensitive — through obscurity. There were significant efficiency gains for our national security when the secretary of state ran her main e-mail account in unclassified form. No artificial barriers to information sharing. A bright line against including truly classified documents. A standing rebuke to the massive overclassification all around her. There are real secrets. This is where I diverge from the Julian Assanges and the Chelsea Mannings of the world. I don’t want the designs of binary chemical warheads getting out, nor the identities of any brave Iranian or Chinese voices who talk to our embassies or CIA stations. The bottom lines of our diplomats in negotiations, I think we should keep to ourselves until such time as the deals are done. But the real secrets make up only a fraction of the classified universe, and no secret deserves immortality. In fact, essential to the whole idea of democratic government is that secret deals with dictators will come out eventually, not least to deter the worst deals from being made. WikiLeaks produced hysteria in Washington with its large-scale release of U.S. diplomatic cables in 2010. The House Judiciary Committee asked me to talk about whether lawmakers should amend the Espionage Act to prosecute those guys. Bad idea, I said. I predicted that there would be little damage to real national security because most classified cables can be published within a few years with no harm done. I showed Congress the estimates over the years of how much gets classified that doesn’t deserve to be. Ronald Reagan’s executive secretary for the National Security Council, Rodney B. McDaniel, said 90 percent. 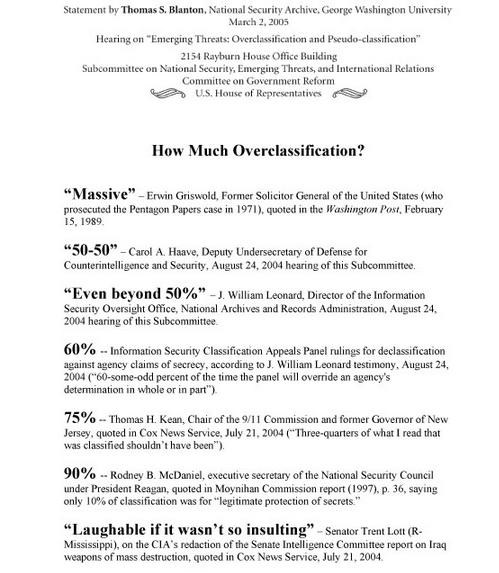 Thomas H. Kean, the Republican head of the 9/11 Commission, said 75 percent of what he saw that was classified should not have been. How much overclassification is there? Yet more evidence from Blantons 2005 testimony. In fact, the congressional inquiry into 9/11 concluded that secrecy had kept the American people — our best allies in the fight against terrorism — from engaging with the threat they faced. The only responders with enough information to disrupt any of the Sept. 11 attacks were the passengers on United Flight 93, who heard through their cellphones what was happening on other planes and attempted to retake control of their own, saving who knows how many lives in the process. Those inspectors general poring over Clinton’s e-mails need to get back to their transparency and accountability jobs, where they should focus on opening — not closing — the files that will empower a free citizenry to protect our country and ourselves, and hold our leaders to account. ← IG’s Want to Open Security Referral into State Department’s Handling of Clinton Records; Focus on Trees and Not Forest of FOIA/Classification Problems. “By the people, for the people”. Anybody remember this phrase? It’s high time the people of America take back control of their country from the corrupt, thieves and power mad ‘individuals’ (representing roughly 80% of all Dems and Reps), that slink along the corridors of Washington DC and do nothing for the population except ignore them, unless it’s those few who are lining said ‘individuals’ pockets with bribe money.